Waterloo 7 Archives - HGR Inc.
Euclid, Ohio, and the Collinwood neighborhood are both full of businesses that support one another. Six degrees of separation. Jerry Schmidt, welding artist of Waterloo 7 Studio, is a customer of HGR. After interviewing him for a blog post, he introduced me to Larry Fielder of Rust, Dust and Other Four Letter Words who also is an HGR customer. I did a blog post about Larry then commissioned him to create a two pieces of industrial art for HGR’s new offices. Larry took me over to Six Shooter Coffee Cafe to see the bars and lamps he had made for the space and introduced me to Pete Brown, Six Shooter’s owner, and to some of the best coffee I’ve had. Pete moved to Cleveland in 2013 and started roasting coffee in the basement of the place in which he lived for his personal use. Since he was 16, he had worked as a barista in a variety of coffee shops in Columbus, including a roasting company, where he learned a lot about the process. His friends started asking for coffee, and in 2014 he formed a limited liability corporation, and the business took off. His first client was The Grocery on Lorain Ave. 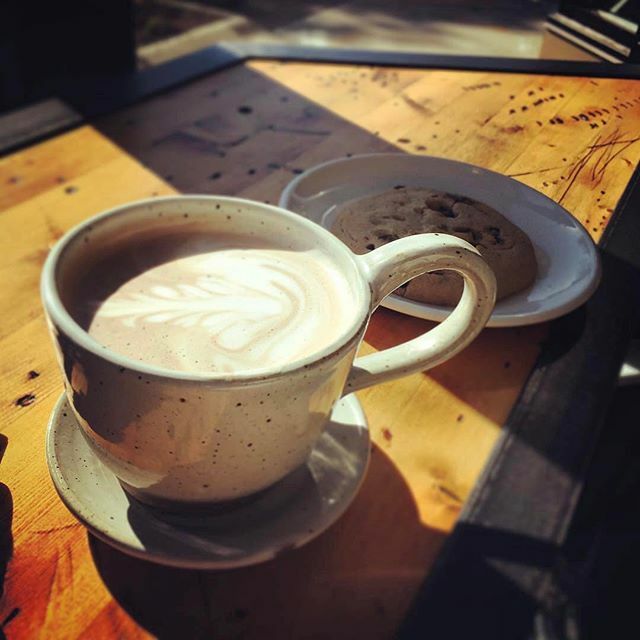 In 2016, he opened his first coffee bar on Waterloo Road in Cleveland’s Collinwood neighborhood. In case you’re wondering where the name Six Shooter came from, President Lyndon B. Johnson used to serve coffee on his ranch in Texas. His coffee was said to be so strong that it could float a revolver. Pete likes strong, smooth, flavorful coffee! Currently, he uses importers from which he buys his beans. Each country produces beans with different flavor profiles, just like wines from different regions. Six Shooter carries beans from Papua New Guinea, Columbia, Brazil, Peru, Tanzania, Ethiopia and Sumatra. Pete roasts them in-house at the company’s roastery located in the Tenk Machine & Tool Company’s building on the West Bank of Cleveland’s Flats. Pete hopes to get to the size where he can buy directly from the producers. Six Shooter roasts 250-300 pounds of beans per week, 52 weeks per year. He has a 5 kg roaster and can roast seven pounds of coffee in 11 to 13 minutes. These beans are used in the coffee bar and sold wholesale to grocery stores, cafes and hotels. 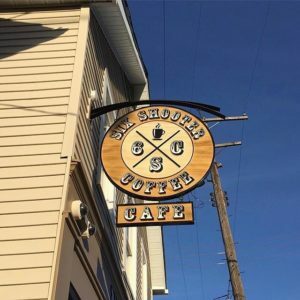 On May 20, Six Shooter’s second coffee bar is opening at the roastery’s location in The Flats, and the location in Collinwood will be extending its hours from 7 a.m. to 5 p.m. on weekdays and 9 a.m. to 5 p.m. on Saturday and Sunday to 7 a.m. to 7 p.m. on weekdays and 8 a.m. to 7 p.m. on Saturday and Sunday. He works fulltime out of the roastery location, while his wife, Tara, and store manager, Sarah, run the café. 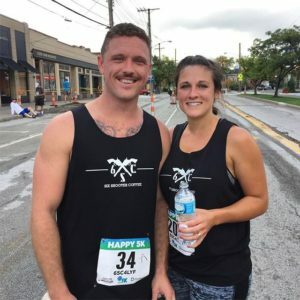 Pete and Tara were married in 2016, two months before the shop opened. When they’re not working running the coffee business 60 hours per week, they enjoy camping, working out and rugby. Pete played rugby in high school, at Ohio University and on three men’s teams after college. He coaches the Shaker Heights High School rugby team.